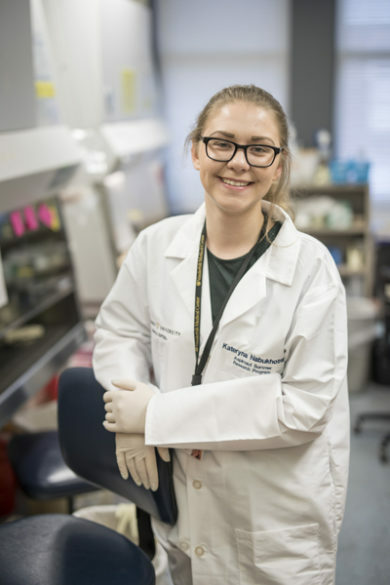 Now in its ninth year, a unique summer research program at Vanderbilt University Medical Center (VUMC) designed primarily for rural students with limited resources is proving that talent has no zip code. Aspirnaut is a STEM “pipeline” for diversity. Over the past eight summers, it has provided research experiences to 200 high school and undergraduate students. Nearly 90 percent of high school participants come from rural areas. Sixty percent of all participants are from families with limited incomes. More than 40 percent are members of groups underrepresented in STEM fields (science, technology, engineering and math) including African-Americans and Native Americans. Eighty percent of the first 100 high school students in the program have graduated and nearly all have gone onto colleges and universities across the country. Many of them are the first in their families to do so. Eighty percent of those in college are majoring in STEM fields, compared to 30 percent of college students nationwide. Seventy percent of former undergraduate Aspirnauts are now attending medical school or are pursuing Master’s or Ph.D. degrees in the biomedical sciences. According to the Hudsons, the program’s holistic approach and its long-term engagement with participants are key factors that enable it to outstrip national norms. The Aspirnaut program provides six weeks of an intensive research experience for high school students and 10 weeks for college students. Forty hours a week is spent in “guided discovery,” learning with the help of mentors how to craft significant research questions to answer. Participants log 10 hours each week in “professional discovery” activities including instruction in communication skills, prep courses for general and organic chemistry and medical and graduate school entrance exams, and distinguished speaker luncheons that help them connect with potential mentors. Another 10 hours per week is spent in “individual discovery” — one-on-one career planning, introduction to psychological skills, a seminar on unconscious bias and social activities — to help participants meet life’s challenges. 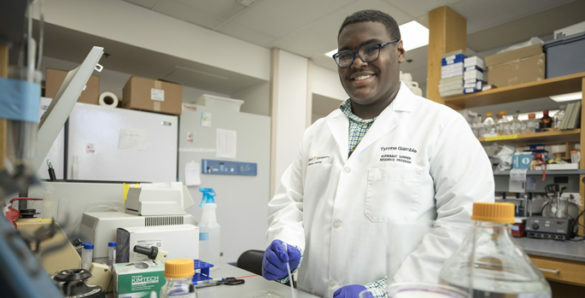 Billy Hudson, whose research has advanced understanding of the molecular basis of kidney disease, calls the program a form of “time travel.” Participants “acquire knowledge and skills six to eight years ahead of their classmates on which to make decisions about their lives,” he said. After they leave the lab, participants are contacted regularly by the Aspirnaut team and encouraged to use resources and mentors long-term. “The Aspirnaut mentors and staff are deeply invested in the success of participants,” said Julie Hudson, who is also vice president of Medical Center Relations and an anesthesiologist by training. “They’re going to help with next steps as well as long-term strategy. Last week during an international workshop at VUMC sponsored by the American Society for Matrix Biology, the high school participants displayed posters and gave oral presentations describing their summer research projects. In early August the undergraduate participants will present their research findings at a national conference in Bethesda, Maryland, hosted by the National Institute of Diabetes and Digestive and Kidney Diseases (NIDDK). Part of the National Institutes of Health, NIDDK has helped support the Aspirnaut program since 2009. Also this summer the Life Sciences Institute at the University of Michigan in Ann Arbor launched the first pilot Aspirnaut program outside Vanderbilt. Two high school students and a college student spent six weeks on campus. Roger Cone, Ph.D., a former Vanderbilt department chair who directs the Life Sciences Institute and who organized the pilot program, is now seeking funding to continue it next summer. “We need programs like this so that we generate adequate numbers of people to go to medical school and provide high quality health care to all parts of the country,” Cone said. Increasing the number of people in STEM careers also helps the nation compete on the global stage. Over the years, the Aspirnaut program has developed several “strategic partnerships” with high schools from Maine to New Mexico, and with Kentucky’s Berea College, which provides work-study opportunities for students with limited resources. One partner, KIPP Delta Public Schools in Helena, Arkansas, has sent more than 20 students through the Aspirnaut program. KIPP operates college-preparatory schools in underserved communities in several states. “The trajectory of these kids is just fabulous in college,” said Amy Charpentier, KIPP Delta’s chief academic officer. Since 2013, 14 Native American participants have completed Aspirnaut summer programs. 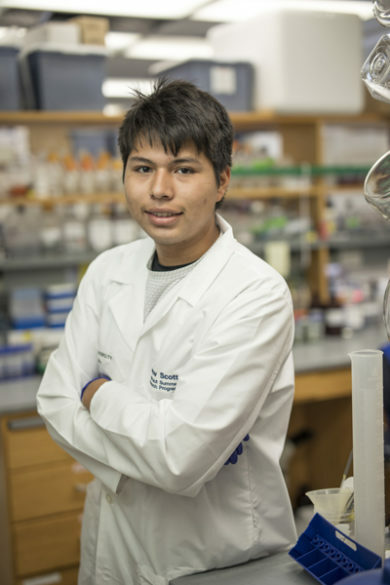 Of the eight who have graduated from high school, six have majored in STEM fields in universities including Vanderbilt, said Dee Sabattus, director of Tribal Health Program Support for Nashville-based United South and Eastern Tribes (USET). “Having students knowledgeable in the STEM arena is going to be extremely valuable to our continued growth and development as Tribal Nations,” said USET Executive Director Kitcki Carroll. “We are hopeful that all of the Aspirnaut students will pursue post-secondary education. We are confident the program will be a valuable learning experience they can build upon. As our Native students eventually make their way into the workforce, we are hopeful they will find ways to give back to their Tribal Nation communities,” he said. This summer’s contingent included 19 undergraduates from as far away as Nigeria and the Ukraine and 15 high school students from Arkansas, Florida, Maine, Mississippi and New Mexico as well as Tennessee. 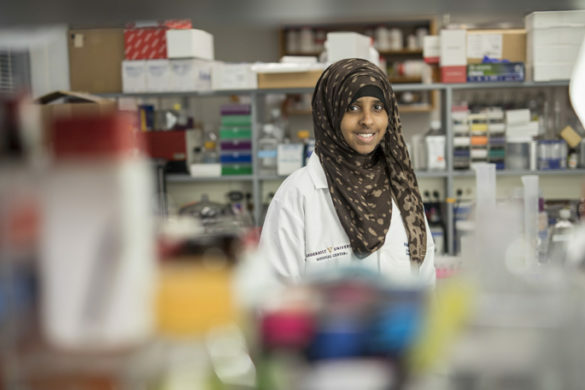 The high school students included Halima Ibrahim, a rising junior at STEM Preparatory Academy High School in Nashville who aspires to be an astronomer, an archeologist, a historian, a physicist, a marine biologist, a writer, a doctor, an inventor — and a sailor. 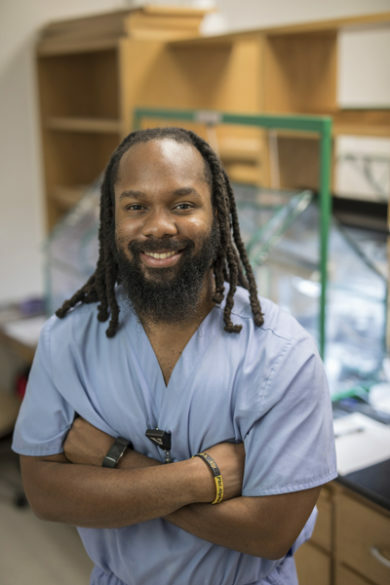 Xavier Shackelford, from tiny Marianna, Arkansas, spent two summers as an Aspirnaut before completing his bachelor’s degree in Biology at the University of Arkansas in 2016. This summer he was an Aspirnaut research assistant while preparing to work on his master’s degree and begin a teaching job at a KIPP school in Nashville.